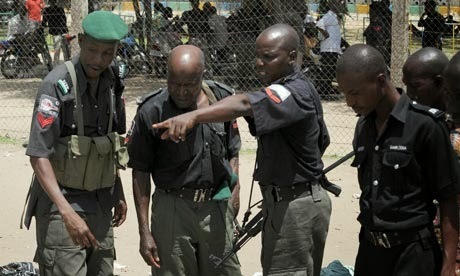 The Federal Special Anti-Robbery Squad, FSARS, has arrested nine persons, including a native doctor, in connection with the killing of a staff of the Nigerian National Petroleum Corporation, NNPC. The Deputy Commissioner of Police FSARS, Chris Ezike, confirmed the arrest while speaking with a correspondent in Lagos on Thursday. Mr. Ezike, who is of the Adeniji-Adele Police Station, said the suspects committed the crime on September 23, 2012. He gave the name of the NNPC staff as Sylvester Emefiele, who worked with NNPC’s Transformation Office in Abuja. The commissioner said that the wife of the victim, Ngozi, had petitioned the Inspector-General of police in September, 2012 over the disappearance of her husband after leaving Lagos for Abuja. Mr. Ezike said that the woman revealed that her husband left Lagos for Abuja on the invitation of his boss to process his visa for a training programme in Hungary. “She claimed her husband sent her SMS on September 23, 2012 at about 8.37 p.m.that he was at Gwagwalada and that was the last she heard from him. “She also stated that surprisingly, she noticed that withdrawals were being made from her husband’s accounts through ATM,” he said. Mr. Ezike said that the arrest was made possible through scientific tracking of the mobile phone line of the victims, stressing that a school drop-out was first arrested in Ilesa, Osun with the victim’s blackberry handset. “The suspect confessed that he bought the phone from one of the suspects, a cab driver in Modakeke in Osun State for N22, 000,” he said. He added that after the arrest of the cab driver in Abuja, they were able to arrest others in connection with the crime. “Two of the suspects confessed that they picked up the victim in their taxi cab with registration No. AG 956 KEF at Giri in the Gwagwalada Area Council to be dropped at Finance Quarters, Wuye, Abuja. The driver of the cab was the one that picked the victim and picked the second suspect some metres away even as the victim protested, the driver pleaded with the victim that the man was his brother. The second suspect claimed he brought out hammer as a decoy for pistol as soon as he entered the front of the cab. They subdued the victim and took him to a nearby bush,” Mr. Ejike narrated. He said the suspects searched and dispossessed the victim of his laptop, N3,000 cash, three ATM cards and other items. “They claimed they forced the victim to disclose his ATM pin numbers. One of the suspects went to the banks to withdraw N180, 000 immediately and the second suspect watch over the victim. They claimed that after they discovered the victim had more money in his accounts, they used charm prepared by the native doctor on him and he became weak. They claimed they discovered that the man died the following day and they abandoned the corpse in the bus and escaped,” Mr. Ejike said. He said that on June 10, 2013, the two suspects led the DCP and crime scene forensic experts led by the police doctor, Emenike Chinenyenwa, to the scene located at Idu along Airport Road, eight kilometres from Nnamdi Azikiwe International Airport junction, Abuja. “At the scene, we met a completely decomposed skeleton suspected to be the remains of the victim. The bones of the legs were still stuck in the jeans trousers while his ribs were scattered around. His wrist watch, one leg of his sandals and the twine rope used in tying him and other belongings were recovered there,” he said. He added that the remains were packaged by forensic experts for autopsy by the police pathologist and the victim’s family invited to identify the items recovered. The wife and younger brother of the deceased identified them, Mr. Ejike said. “The two suspects also led detectives to arrest the native doctor that prepared the charm in Ipetumodu, Osun State. Our investigation has been able to establish offences of criminal conspiracy, kidnapping, armed robbery and culpable homicide,” he said. The DCP said that after the DNA test on the bones and tooth of the victim, the report by the Force Chief Consultant Pathologist, Akhiwu Wilson, showed that they were similar to that of the victim’s son and his brother. “The suspects were first arraigned on November 19, 2013 at High Court, FCT, Abuja. The suspects are coming to court again on Jan. 31, 2014 now that the lab result is out,” Mr. Ezike added.